* Measured after the collimating lens. The Dot laser will produce a dot. The line laser will project a line onto a surface. Long or short lines available. 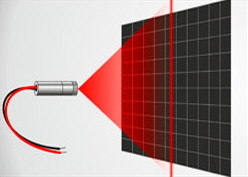 Narrow linewidth, single longitudinal mode lasers suitable for making holograms and other interference applications include our model VM65012 and VM65013 Industrial Laser Modules and our model VM65002 and VM65003 Standard Laser Modules listed below. These single frequency lasers feature a coherence length greater than 1 meter! Narrow linewidth: suitable for holography and other interference applications. Use the drop-down selection to choose your laser line fan-angle. For over 25 years Midwest Laser Products has been providing quality and reliable laser diode modules at affordable prices. Discounts are available for large quantity purchases. A knowledgeable sales engineer is available to help you with any questions you may have about the use of these lasers. The output of these modules are set to meet Class II, Class IIIa, and Class IIIb requirements of 21CFR 1040.10 of the C.D.R.H. The modules can be used for research, studies, or on an OEM basis for incorporation into other products. Each laser complies with RoHS requirements. C.D.R.H. standards it is necessary for the final product to completely enclose the laser emission in accordance to class I requirements or, if the beam is accessible, carry the appropriate warning labels, and emission control. Other styles and custom designs available. Call to discuss your needs.